Today I am using a small bit of Permanent Sap Green and Burnt Sienna mixed to create an olive green. You can add some New Gamboge if you want it to be a little more golden. I use a wet, but strong mixture to paint the stripes on the right side of the boat. Then, I added some water and painted a wetter version of the same mixture on the left side. It needs to be wetter and lighter because it is not in shadow. A bit of French Ultramarine Blue was used in the little bumper at the corner of the dock to create a soft shadow. 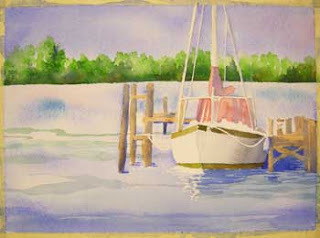 I also used a touch of Burnt Sienna with a number six round brush that has a nice point, and run a very light, very thin stroke of pigment here and there on the right sides of the mast and ropes that go up through the tree line.